Basic 2 - Where does opal come from ? 3. Where does it come from ? More than 90% of the world's precious opals come from Australia, and the rest can be found in other parts of the world such as Mexico, Brazil, Indonesia, Czech Republic, Ethiopia and USA. Opals from Mexico (called "Mexican Opal") has more water and is transparent or extremely translucent. On the other hand, opals from Australia usually are not called "Australian Opal" but have different names depending on different types. There are several ways to categorise these opals, but here we are going to tell you the most common way. There are three types of opal mined in Australia and they are White Opal, Boulder Opal and Black Opal. This is a picture of White opal. As you can see, it has a white or milky base colour that is why it is called "White Opal". This is the most common opal of all because the production is much larger than other types of opal. So many people believe this is the only opal available. This type of opal sometimes called light opal or milk opal due to its appearance. Coober Pedy (South Australia ) is the main source of White Opal. Boulder opal comes from Queensland, Australia. 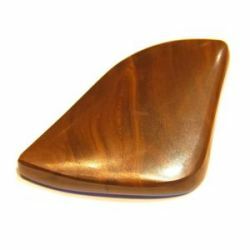 The name of this comes from the way it has formed naturally in an ironstone rock (boulder). The pictures below are taken from face and back side of the same stone. The picture on the right is the face and left picture is the back. 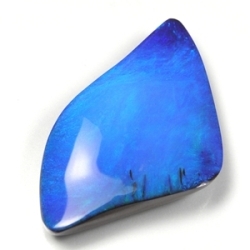 This type of opal typically presents as a thin layer of opal over a dark brown base when cut. Let's have a look at another picture. This is an uncut boulder rock. You can see a thin layer of opal inside the brown ironstone. 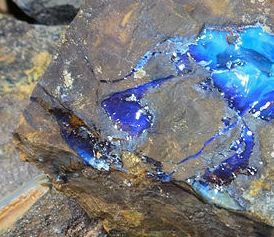 Boulder opal usually has a unique shape. And sometimes has "hills" and "valleys" on the surface. That's why these stones are preferred by people who have more originality or who are more progressive in their jewellery tastes. And also this is the most popular opal amongst jewellery designers around the world. On the next page, we are going to talk about Black Opal. Let's go.